= Kongetsu wa kibishii naa..
Hi, everyone! I am working on my budget for the month. It looks tight! = Maggie sensei wa kibishii. = Maggie is a strict teacher. So today’s first key word is 節約 ( = setsuyaku) ! 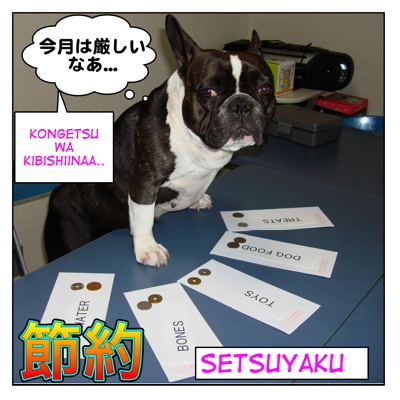 Let’s check 漢字 ( = kanji) first! = Keihi wo setsugen suru. = Shibaraku osake wo sessei suru. = Yaku hyakumei hodo no hito ga paatei ni shoutai sareat. = About 100 people were invited to the party. It means to economize, to cut corners. = Rainen kekkon suru node shibaraku setsuyaku shinai to ikenai. = I have to be save money ’cause I am going to get married next year. = Jikan no setsuyaku no tame kousoku douro wo riyou shite kudasai. = Please use the highway in order to save time. = Uchi no kaisha wa keihi wo setsuyaku no tame zangyou wo kongetsu kara kinshi shita. = Our company banned overtime work to cut down the cost. = Chotto kyou wa shokuhi wo kenyaku shite konbini bentou wo katte kaerimasu. I will get a bento（boxed lunch, or a type of Japanese TV dinner) at convenience store to cut the food cost. Many of you have already known the meaning of ケチ（ = kechi), right? = Nee, atarashii omocha katte! = Dame, ima okane nai kara! = Kare wa kechi dakara kurisumasu ni nanimo katte kurenai! = He is cheap so he won’t buy me anything for Christmas! = Kechiranai de kore choudai yo! = Kono ryouri wa wain wo kechikechi shinai de ippai tsukatte kudasai. = Don’t skimp on the wine and use it a lot for the dish. = Kotoshi wa bounasu ga sukunai node mina saifu no himo ga katai. = The bonus this year is so little that everybody is keeping a tight hold on one’s purse strings. = Anata no ie dewa dare ga saifu no himo wo nigitte imasu ka? = Who holds the purse string? = sorosoro chokin ga soko wo tuite kita. = My saving is drying up. = Ooku no shufu ga kossori to hesokuri wo shiteiru. = Many housewives stash money in secret. =to waste, to waste or spend money for something in vain. It means waste, wasteful but it has a sense, “It is still usable and it’s a shame to waste it or throw away. = Mada kore taberareru yo. Mottai nai kara watashi ni choudai. = This offer is too good for me. = Kare wa watashi niwa mottainai hito desu. = He is out of my league. /He is too good for me./ I am not good enough for him. = Kore kara shibaraku setsuyaku shinakuccha. = I have to live economically for a while. = Kono burogu mo ichido kuru dake dewa watashi no rouryoku ga mottai nai kara nandomo kitene. = It would be waste of my work if you just visit here once so please come back here again an again! Wonderful website and truly helpful lessons! After I finished basic Japanese grammar I was stuck for quite a while, not knowing how to continue developing my knowledge. It’s really difficult to transition from purely academic level to more colloquial expressions. Your amazing blog is really helping me with that. Thank you so much for your hard work and dedication. I’m happy to hear you found my site help. Can you please explain to me what is the difference between こっそり and ひそかに? Glad to hear you think this site is useful. 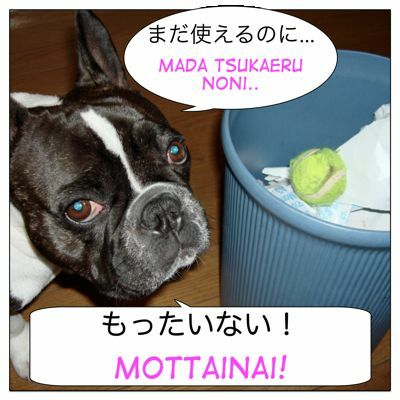 They both mean “secretly” but こっそり is used mainly for actions ひそかに can be used actions and also feelings for others. = To love him secretly. Here am I again, always nagging with questions, haha. 1) Are 倹約 and 節約 total synonyms? No diffence in nuance or usage? 2) 倹約家 and 節約家 mean saver but… in a good way or negative way? The difference is very subtle but here you go! 倹約＝金や物を無駄遣いしないように努めること。= Try not to waste money or things. Thank you! And if you call someone 倹約家 or 節約家, would that be praise? Or can it be negative? They both are not negative. But you may have to be careful when and how you use it. Because it may sound that person is cheap. You know what I mean.. Thank you!!! You are always so sweet! !